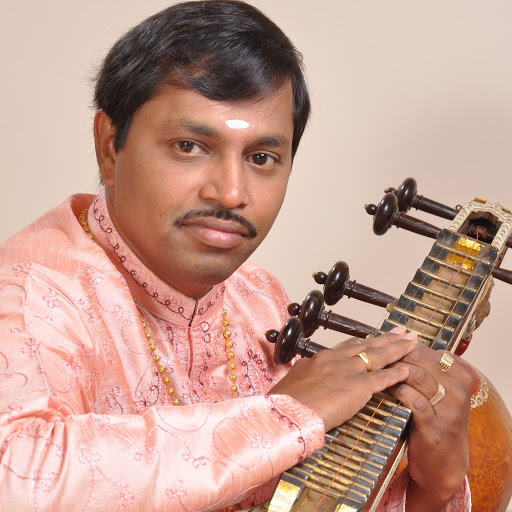 D. Srinivas, began his career as a child prodigy by giving a concert at AIR when he was just 9 years of age. He was born in a family of musicians at Hyderabad in Andhra Pradesh in the year 1968. His mother Smt. D. L. Tulasi, a popular Veena guru, having identified his taste and talent in Veena, initiated and encouraged him to pursue and master the art. His veena recitals are very pleasing and has an effortless technique of playing and producing fine tonal quality. His finger movements are smooth even in high speed play. He is very traditional in his approach and has a gene of excellence. Vidwan Sri N.S. Srinivasan a disciple of flute maestro late Sri T.R. Mahalingam, was the master architect to introduce him as an artiste with laudable individual traits.In the year 1992 when he was 23 years he became ‘A’ Grade Veena Artiste of All India Radio. He has performed across the globe, in Aksharavani Sangeetha Sammelan & many National Programme of Music Concerts from All India Radio & Doordarshan.He has also composed music for Documentary films and Music and Dance Ballets. Has won several awards and accolades in his musical journey.He has been honoured with titles like Veena Vidhwamani, Veena Praveena, Raaga Sudhakara, Vainika Ratna.